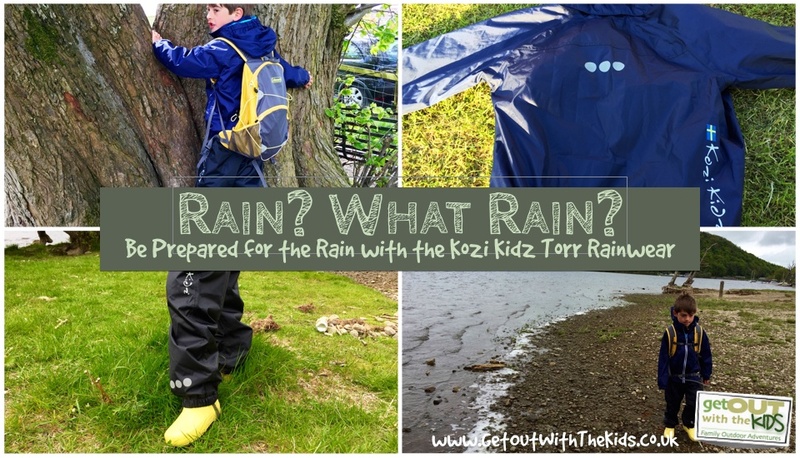 We test out the Kozi Kidz Torr Rain Jacket and Trousers. 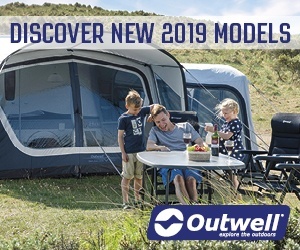 A great option for school, the park, or those family adventures. If you are regular readers of our blog you’ll know we are big fans of Kozi Kidz – a range of Swedish designed, fashionable, and functional outdoor clothing for kids from six months to 10 years. 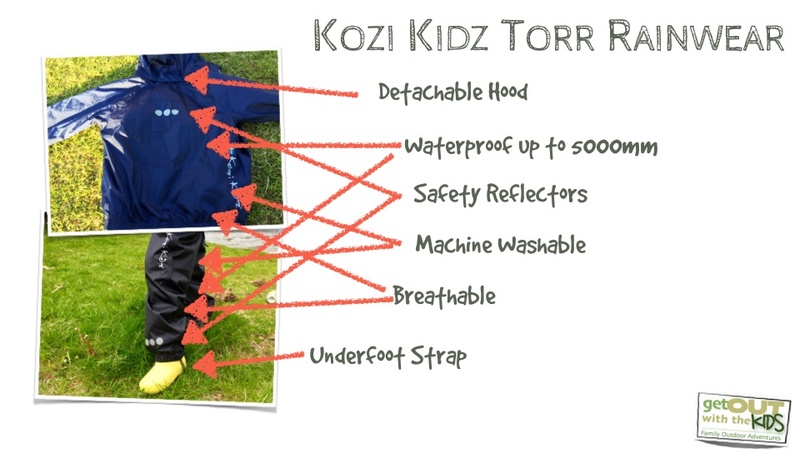 Our friends over at Kozi Kidz sent over a Torr rain jacket and trouser set to try out. The Torr Rain Jacket is available in colours to suit all tastes and preferences and the trousers are available in black. We opted for the Navy Sea colour. Summer may be here but it’s still rains, so it’s always a good idea to be prepared!  To test out the Torr rain jacket and trousers we took them camping with us to the Lake District. They came in very handy when, in true British style, the weather turned windy and wet. Both the jacket and trousers are fully waterproof to 5000mm and when the heavens opened our little tester stayed dry and snug. The jacket provided good body cover without restricting movement and the elasticated hood, waist and wrists made for a good comfortable fit. Here are some features we particularly liked. Detachable hood, a good safety feature and makes the jacket a bit more versatile. Reflector on the back to improve visibility. Another great safety feature. Zipped security pocket. Very handy to keep all those treasures that kids collect on adventures safe. Name label. This is essential if your taking the jacket to school! How many pieces of clothes have your kids lost at school?! Rolls up easily so easy to fit in a rucksack on a day out or a school bag. Machine washable. The jacket has been washed and came out looking like new. This is one of the things that we love about Kozi Kidz clothes: they always wash well and stay looking good! they always wash well and stay looking good! We love all the little features about this jacket that make it a great choice for a rain jacket that will stand up to kids play and adventures. The Torr rain trousers are fully waterproof ( 5000mm ) and breathable. They looked really nice with jacket. They roll up small so easy to fit a rucksack if the weather should turn wet and cold. Some key features we really liked about the Torr Rain Trousers. Reflectors on the legs. A great safety feature. Silicone footstraps so you get a good secure fit over wellies and the rain doesn’t get underneath the trousers. Again these are washable, and again, performed well when washed. Rain trousers can look a bit bland and boring, but these trousers have the Kozi Kidz logo down the the side of the leg which I really liked and added a bit of interest and style to the trousers. Can’t find anything to grumble about. We are all ready now for those summer down pours and we know Kozi Kidz gear won’t let us down.